Ali has requested outfit ideas for her younger sister who has just started to wear hijab. Firstly I say congratulations, and mashallah! Pink al-amira £2.99, Simply Islam; print dress £8.80, Debenhams; canvas shoes £10, Barratts; flare jeans £11, BHS; blue al-amira £4.49, Muslim Base; aqua smocked dress £12-£16, Debenhams; canvas trainer £9, BHS. Aren't they just? 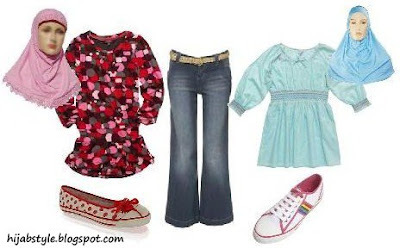 Young girls clothes are so sweet! Glad you liked it! Let me know what you guys buy on your shopping trip! omg. I still wear tunics over jeans! HAHAHAA... shows how i still perceive myself... as a lil girl! Anon: LOL, I wear tunics over jeans too most days, but more 'grown up' versions! Also, most little girls don't like wearing maxi skirts and the like, but older girls do! ha ha.. oh yh, on the topic of skirts do you know where I could find a variety of casual skirts anywhere?? Also, if you are ever looking for something on my blog, you can always use the search box in the top left hand corner. thanks! Do u think Mango still sells those skirts? What gorgeously cute little outfits! I'm 18 and I would probably still wear something similar, lol!